How we got “succotash” from the Narragansett word “msickquatash” is still a mystery. What we do know, is that this succulent corn and lima bean-based vegetable dish originated with native Americans who harvested indigenous crops from the eastern woodlands. 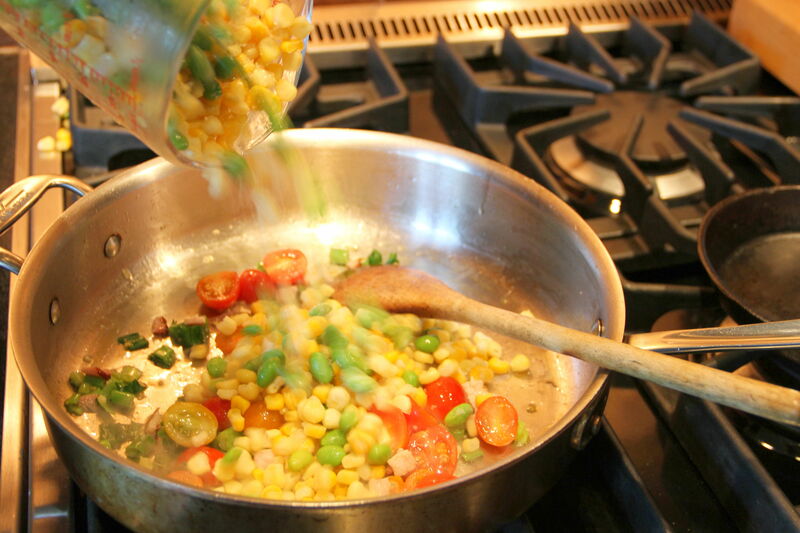 Popularity of succotash has waxed and waned. It experienced a mini-revival during the Great Depression when meat was scarce, and is a wonderful way to showcase end-of-summer sweet corn, The variability of this dish is extensive. Onions, peppers, and squash make lovely additions. Use fragrant herbs for a refined side dish, or spice it up with some hot cayenne. You can bake it, boil it, broil it, or encase it in a piecrust. 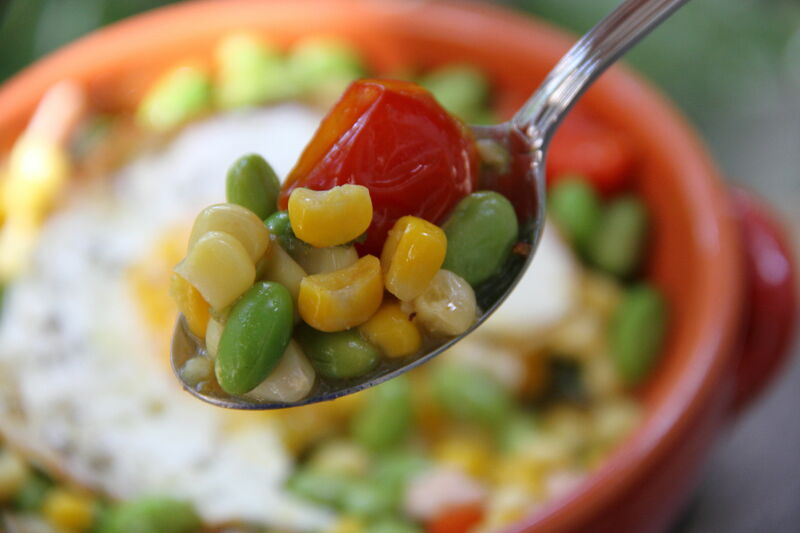 In this simple recipe, I replaced the traditional limas with perky and popular edamame (green soy beans), adding a punch of color and healthy protein. I also decided to add a little lean meat – thus the “hash” AND a rhyming recipe. J Feel free to omit the Canadian bacon for a perfectly satisfying vegetarian option. It only takes about 15 minutes to prepare this bountiful dish. When topped with a crispy fried egg, even the biggest carnivores will be delighted with this colorful cornucopia of veggies and a Narragansett-inspired breakfast in bed. Heat about half the olive oil in heavy saucepan over medium heat. Add garlic, Canadian bacon and green onions and sauté for 1 to 2 minutes, or until garlic is golden but not yet browned. 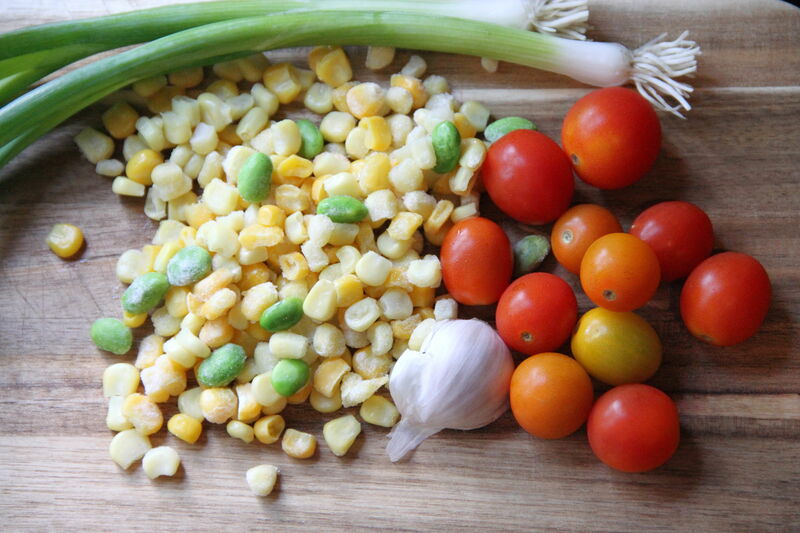 Add corn kernels, edamame, cherry tomatoes and vegetable broth. Season with salt and pepper. Cook until lightly bubbling, then reduce heat, cover, and simmer for 5 to 10 minutes, until most liquid has evaporated. In the meantime, add remaining olive oil to a large heavy frying pan. Crack eggs into the pan one at a time, making sure to leave enough space between the eggs so the whites don’t run together. Season with salt and pepper. Cook each egg until white is solid, but yolk is still soft, about 2 to 2½ minutes. 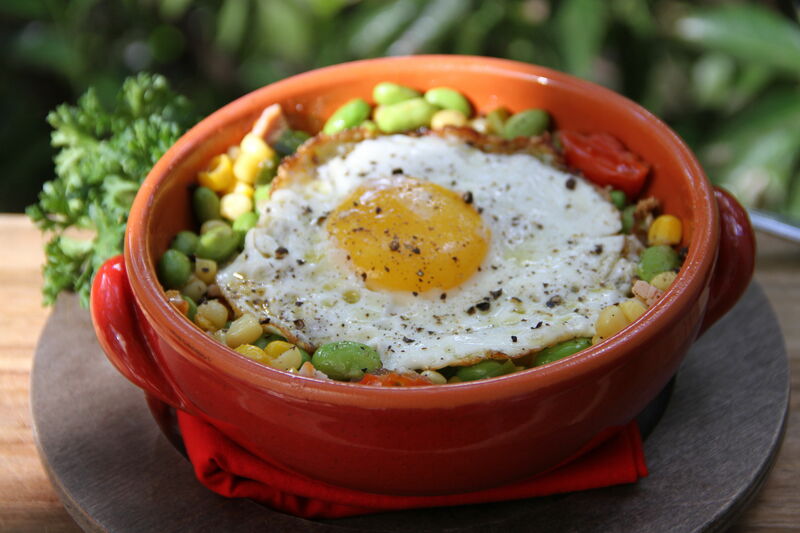 Place half the succotash hash in each of two dishes. Top each with a fried egg. Garnish with fresh parsley, if you like, and serve hot.